Geranium ‘Elke’ is a really stunning new introduction to the G. sanguineum family. It makes superb ground cover for the front of border, a bank or over walls. Flowering well in pots, it could even be placed into perennial hanging baskets. 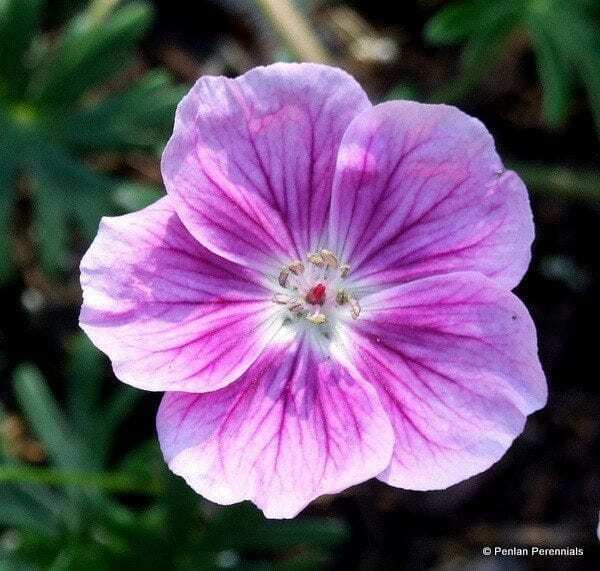 It is smothered with luminous white-eyed, pink flowers all summer and the petals are edged in white making this distinctly different to other members of the family. Easy to grow, hardy, pest and disease resistant. The dark green, heavily dissected foliage gives it a neat habit, only 20cm/8″ high. Keep dead-heading to maintain flowering. Propagate by stem cuttings. When newly planted give it a mulch for the first winter.